Graphing Horizontal and Vertical Lines Supplemental Resource for practice and notes. FREE! 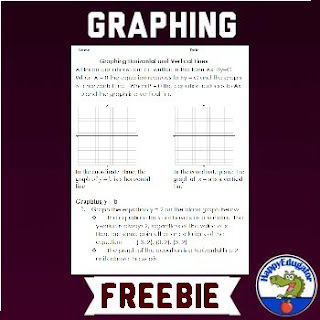 Examples of graphing horizontal and vertical lines are shown on this handout worksheet for guided practice, and then there are 5 practice equations to graph in different colors for independent practice. Supports common core state standards! • Look for the green star near the top of any page within my store and click it to become a follower. • Please give a quick rating and leave a helpful comment for the product. CCSS.Math.Content.6.NS.C.6b Understand signs of numbers in ordered pairs as indicating locations in quadrants of the coordinate plane; recognize that when two ordered pairs differ only by signs, the locations of the points are related by reflections across one or both axes. CCSS.Math.Content.6.NS.C.6c Find and position integers and other rational numbers on a horizontal or vertical number line diagram; find and position pairs of integers and other rational numbers on a coordinate plane. © Deborah Hayes aka HappyEdugator. This resource is for classroom or homeschool use.